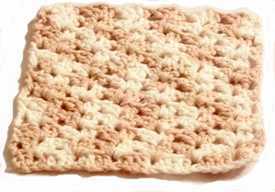 Here’s an easy crocheted dishcloth pattern, worked in a scalloped shell stitch known as “fishscale” because it looks like the symmetrical, scalloped scales of a fish. That might sound a little too “fishy”, but think warm coral reefs with pretty tropical fish because the effect is very pretty. I wanted to try out a little fish scale crochet stitch, so I ended up making these cotton dish cloths as my samples. I would make them again as the stitch seems well suited for this purpose, giving a nice texture to the cloth. Increase the hook size to loosen the tightness of the weave. On this page, you can see the coffee and cream dish cloth is smaller, and more tightly woven, being worked on a 4.00mm hook. It made a 6½ inch square for me. If you like this gauge, but want a larger square, increase the length of the beginning chain. Alternatively, you can make the same length chain, but use a 6.00mm hook, like the blue dish cloth shown here, which ended up about 7½ inches. Make a chain to suit the size that you want, using multiples of three, plus 2. I made a chain of 24, plus 2, for a total chain length of 26 stitches. ROW 1: All in dc (or all treble in U.K. terms). ROW 2: 3 ch; *(2 dc, 1 ch, 2 dc) between 2 dc, miss 3 dc*; 1 dc. FOLLOWING ROWS: 3 ch; *2 dc, 1 ch, 2 dc) in 1 ch space*; 1 dc in 3 ch at beginning of previous row. Weave in ends to finish.